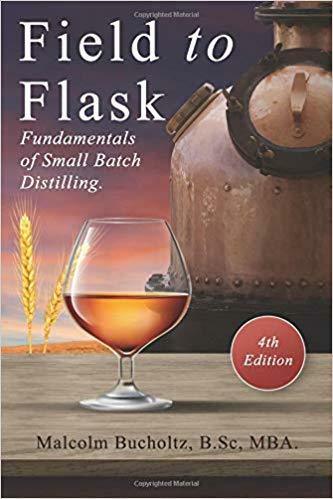 Field to Flask (4th Edition): Fundamentals of Small Batch Distilling. Over the past decade, the craft distilling movement has grown to approximately 1500 small batch distillers in the USA, 300 in the UK, 150 in Canada and 100 in Australia. Whether your passion is to start distilling as a hobby or to start a licensed small batch craft distillery, the key to successful making top quality spirits is a thorough understanding of raw materials and a solid grasp of the science behind mashing, fermentation, distillation, oak ageing and the use of water and yeast. As well as the history of alcoholic beverages and the legal definitions of spirit types, this 4th Edition of Field to Flask explores the legislation that governs craft distilling in Canada, the UK and the USA and the complex science behind mashing, fermenting, distilling and oak ageing of alcoholic spirits. This edition also examines marketing strategies for gaining market attention as a small distiller, manufacturing of alcoholic beverages by commercial distilleries, and wraps up with the recipe ideas to stimulate the imagination of both the hobbyist and potential licensed craft distillers alike.